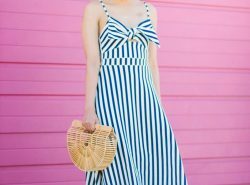 Although I own several Monogram things, I actually don’t own a monogram article of clothing. I have monogram notebooks, mugs (tons of coffee mugs haha), and random knick knacks. So I was surprised that I didn’t have a monogrammed article of clothing yet. This sweatshirt is my first. I love Marley Lilly’s wide selection of monogrammed clothing. In addition to selecting an item, each one is customizable. After finding the piece that suits your style, you can customize the color of your clothing and font. Then you have the option of which font style. I was on that site for a good few hours just customizing haha. For something that is customized, I was really impressed with the quick shipping. See below some of my favorite monogrammed sweatshirts. Love this soft pink shirt!! And your braid is so cute! Thanks Amanda! Definitely, it's so much fun to own something personalized! 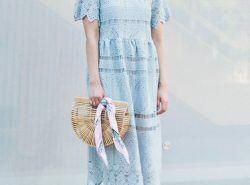 What a super cute look! I love the cheetah sneakers especially! Thanks girl! They're my fav and I literally wear them every day haha! Thanks Alecia!! 🙂 They're fun aren't they?! 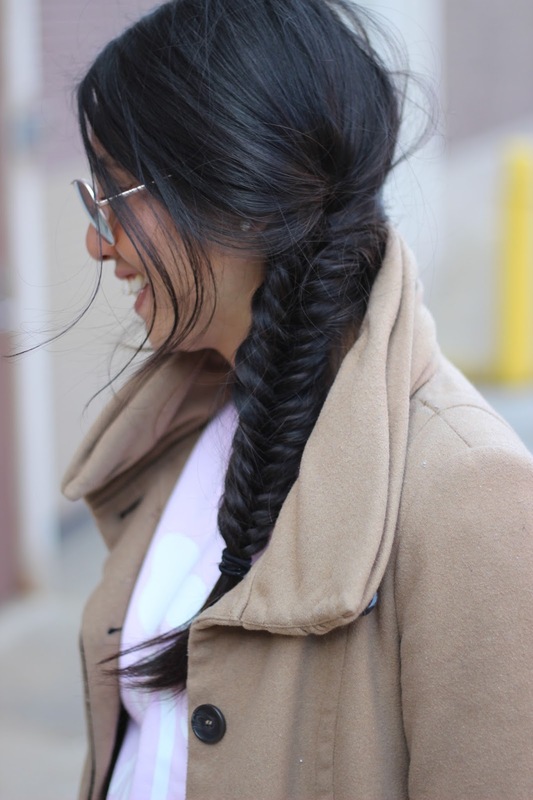 Love your fishtail braid! Have a great weekend. Thanks Amy Ann! Hope you have a great one too! Happy Friday, love! You look stunning, as always! Love your sporty outfit ! You’re such a doll! Aw thanks Vanessa! Hope you have a wonderful weekend! 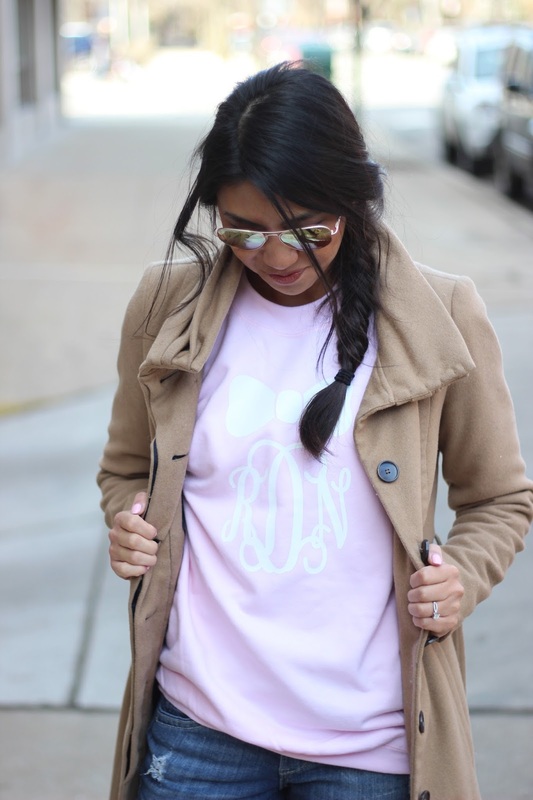 I love this monogrammed sweatshirt! I'm with you, I don't have many monogrammed clothes, lots of other stuff though! I love how you paired it with the leopard shoes..so cute! Your fishtail braid is AMAZING!! Thanks Rachel!! Those leopard sneakers is my favorite! I highly recommend them! 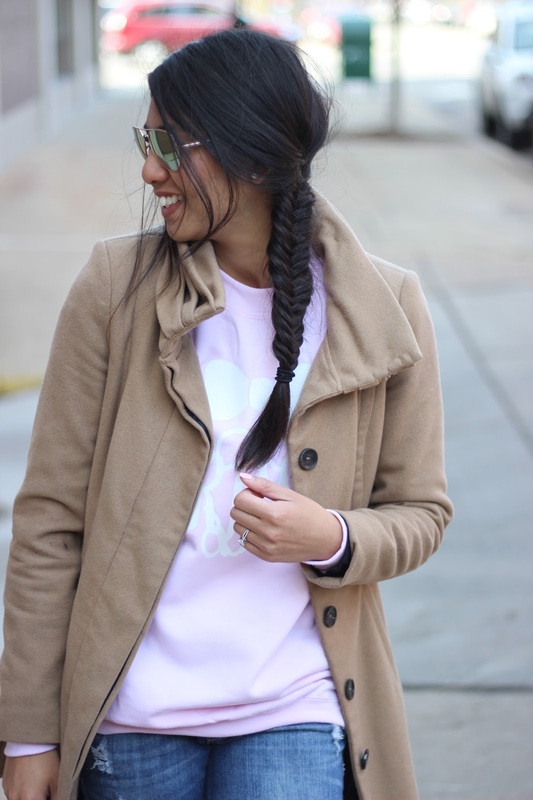 This sweatshirt is ADORABLE and I love your braid! 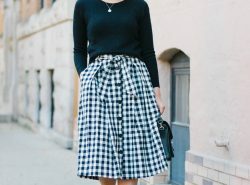 I am the same way as you with monograms, but I am actually obsessed with your look here! You nailed it! Getting monogram knick knacks is so easy to do. For some reason, getting a piece of clothing didn't come to mind haha,. Thanks Meg! Another adorable look! 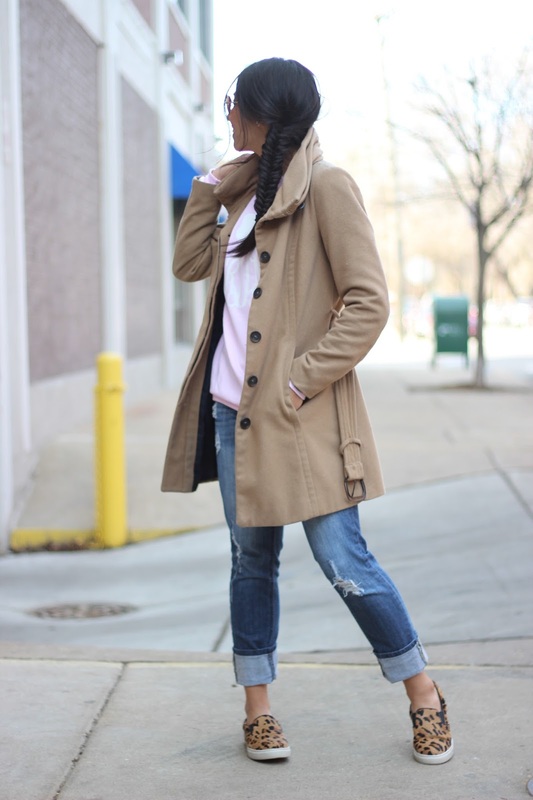 I love this laid back outfit, the sneaks are my fav….and great braid! Love how you styled up the sweatshirt! So so cute! Ah! This is so cute! I so need to get one with my soon to be last name. (; Have a lovely weekend Rach! love those shoes …so beautiful..would you like to follow each other on GFC, i'll follow back ?? Thanks Chify! Thanks for stopping by! Thanks Gina! I think that was luck. My hair never looks good! LOVE that sweater… it looks super soft! LOVE THIS SLIPPONSSS ! ;D a lottttt !! Believe it or not, I don't own ANYTHING monogrammed! It's not nearly as popular up in Toronto, so it hasn't been a trend I've really seen in store. Really?? Not even a mug? I guess it makes sense if it's not common. Pink makes anything look better hehe! That sweatshirts is SOOO Cute!!! Love the color!! I just need this sweater in my life!! It's adorable! !